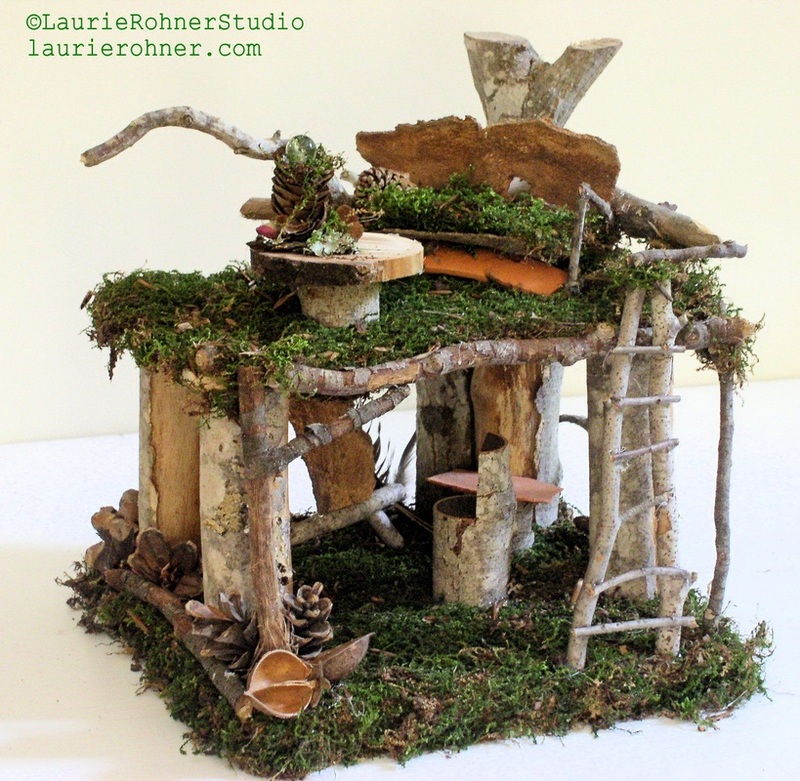 Custom Made Woodland Fairy House Handmade One of a Kind with Fairy Furniture for Between The Weeds by Laurie Rohner. 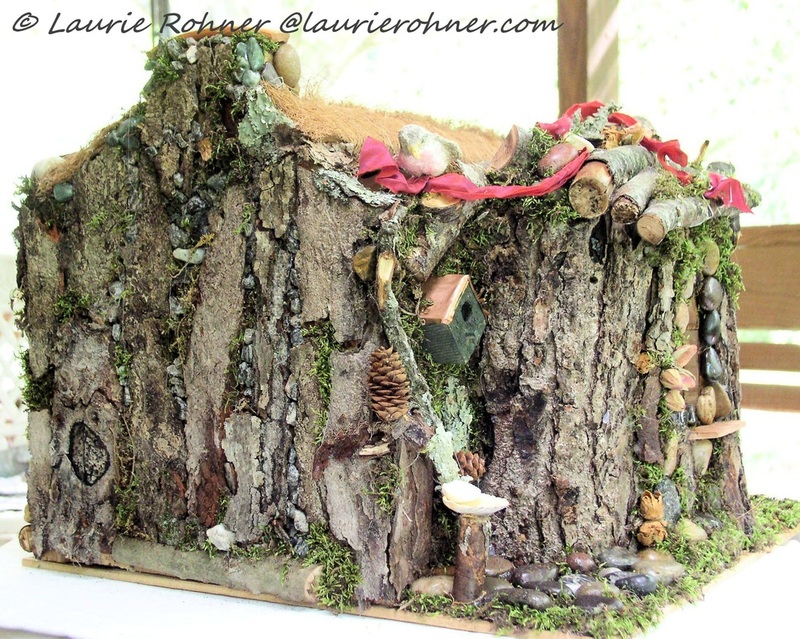 Have a custom made fairy house handmade just for you. I will custom build a fairy house and sculpt it to your vision, at least Briair and I will attempt to create the house you want. Sometimes though my fairy friends will take over and inspire me creating something magical for the fairy who will live there. So maybe it might vary some but I assure you it will be what the fairies want. 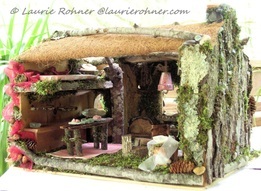 Pictured are three of my custom fairy house fashioned after enchanted woodland fairy house cottages. 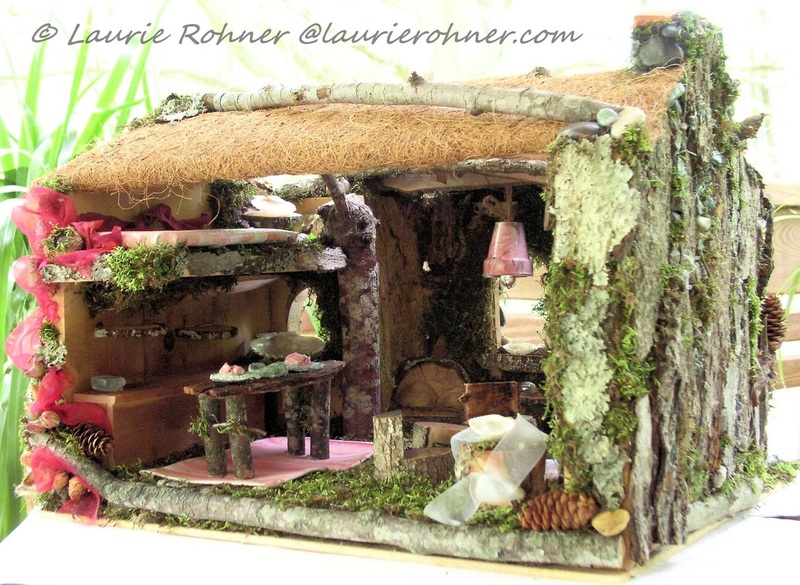 Fairy house range in size but the average for this custom fairy house is 16 x 16 x 14 inches and comes with 2 - 3 rooms which are furnished. 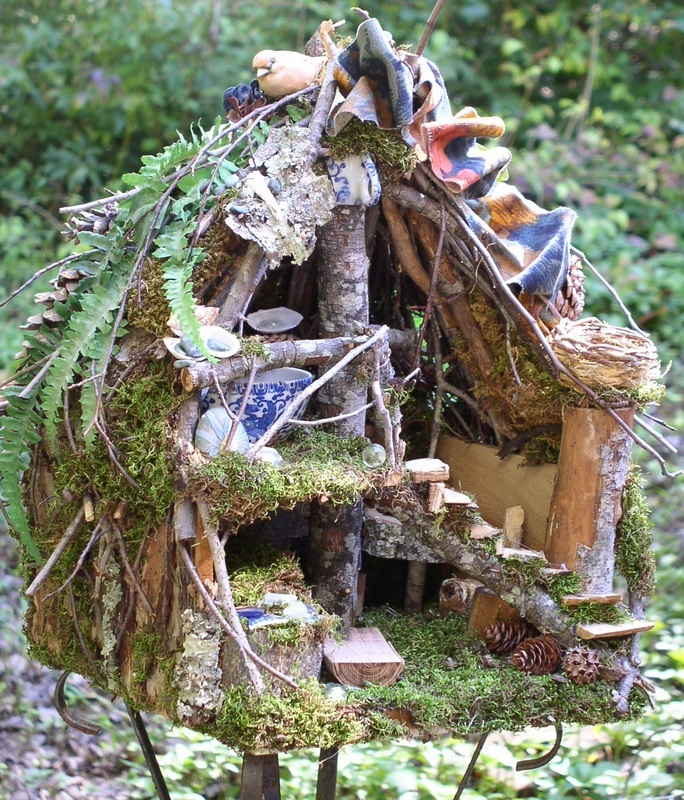 Shown here is the enchanted wood fairy house. Fashioned after the fairy house found in the Enchanted Wood Garden at Wintethur this fairy house features a kitchen with sink, bed in loft and another sink, dining table with hand sculpted lily pad dishes, an alcove with coach, woven chair and painted light, sitting area in front of stone fireplace,on the side a bird nest cradle, original artwork over the fireplace and hand painted floor cloths ready for a wee one to add their own little creative finds. Outside is a thatched style roof that is opened up to allow the light to shine through. The front is fashioned after the toad house but blends into the overall feel of this woodland fairy house. There is a hand sculpted bird stones and moss hand glued over a handmade wood structure. There is a sitting area on one side with a mushroom that gives shelter and on the other side is a birdhouse and bird bath. All my houses are unique and custom crafted for the fairy living in the house. Woodland in nature is handmade from building the base to decorating the interiors. Nature inspired woodland sculpted art can be used outside or in. If placed outside expect only 1 maybe 2 years before the environment plays its part. Will last much longer in and mist the houses, this keeps them from drying out. Keep out of direct sunlight. These are my original designs and I hand craft each piece for my woodland fairy houses. Side with detail of bark and stone and moss hand glued.